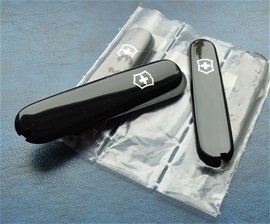 I have bought three sets of 91mm Victorinox Plus scales. It is easy to replace broken handles if necessary. Some used knives can be restored with a good cleaning, oil and sharpening. With new scales as well it will look much better. This I have done a few times before with good result. It can be smart to have some ready if you want to restore a SAK or just simply want your EDC looking smart and best possible all the time. Replacement scales is not so expensive. 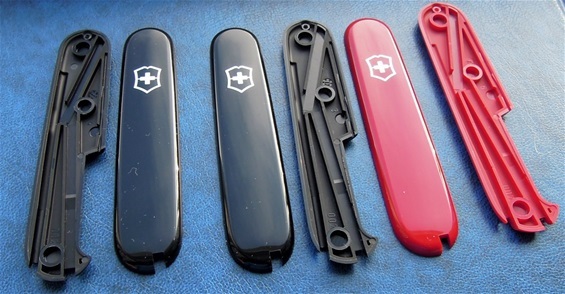 On the picture today you can see how Victorinox recommend replacing handle scales. There are other ways to do it and if you have strong fingers you can press them on. 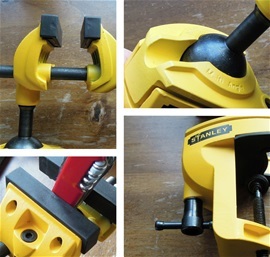 If you use a vice because that is the best way to do it, because it will give the best press fit and it will make sure the bushings are well placed inside the three attach areas on the scales. Make sure to keep an eye on the corkscrew if you use a vice and to glue something on for a protection over the jaws grip areas on the vice. I use a wood vice with some fabric on. I start with placing the two scales over the bushings and place one side with the corkscrew open, then the next side and I finish with placing the entire SAK inside the vice so the center busing attaches. It is also possible to start with one end, then the center and finally the last end. Always place both scales on. On the picture you see how to remove the old scales. It is also possible to use a thin screwdriver into the toothpick/tweezer openings and do a small bend and the side will pop open. Here you can see the inside of the scale. There are three places for the rivets with bushings to be press fit into the plastic. On the bushings on the rivets there are edges that will hold the plastic scales on. There is also a place for the riveted backside functions that is only a cavity. The clue is to get a press fit that makes sure that the scales are attached without warping. The modern scales are partially hollow with beams and a network of areas for the flexibility. There are areas for the hidden functions inside the scales. This is the plus scales that can hold a pen and needle. If you notice there is one additional place that is not opened for short tweezer for another designation. The tweezer goes in the other scale on this. Remember to keep the scales empty when you attach them on the SAK. It is not necessary to use too much pressure to attach the scales. 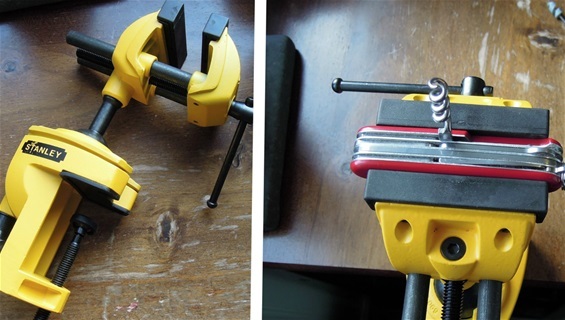 If you use too much then the riveting may get damages causing the functionality to suffer. It is a good feeling placing the spare parts when the scales are assembled. I usually open the corkscrew when I tighten the vice. I have found the perfect device for assemble scales. Rubber parts and with good height towards the screw. every angle can be adjusted! I got myself 3 sets of replacements handle scales in Copenhagen. Two are for the 84mm category and one set for the 91mm. 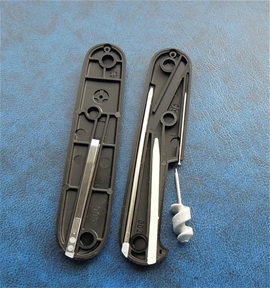 It is very smart to have spare replacement sets for Victorinox SAKs. I have seen several SAKs that are full of dirt and substances with dull blades and broken scales. I have mentioned before how after cleaning sharpening and oil the SAK construction is awakened and then if you put on new scales then you have restored full functionality again.